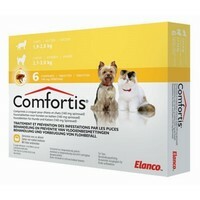 Comfortis Chewable Flea Tablets for Dogs and Cats can be given monthly. Comfortis Flea tablets works for up to 4 weeks and is recommended for pets with immediate flea relief needs, dermatitis issues including FAD, pets that swim or are bathed frequently and homes with other pets. Each tablet contains 140mg Spinosad. Suitable for dogs weighing from 2.1 - 3.0kg and cats weighing 1.9 - 2.8kg.